Shopping or sight-seeing around Charminar in this scorching heat? Head to Masqati Falooda stall outside Hotel Nizam and cool down with their fantastic falooda. Among all the mouth-watering delights that the streets of Hyderabad have to offer, Falooda is one of our favourites. This Persian dessert is one of the most pleasurable things to have in Summer, and Masqati Dairy has been serving it since 1965. Set up by Ibrahim Bin Abdullah Masqati, a businessman, this dairy company has over 50 vehicles making their products available in every nook and corner of the city. One such stall is right outside Hotel Nizam around Charminar and we stopped here for a falooda break. This tiny kiosk and has a variety of flavours and dry fruits arranged neatly. 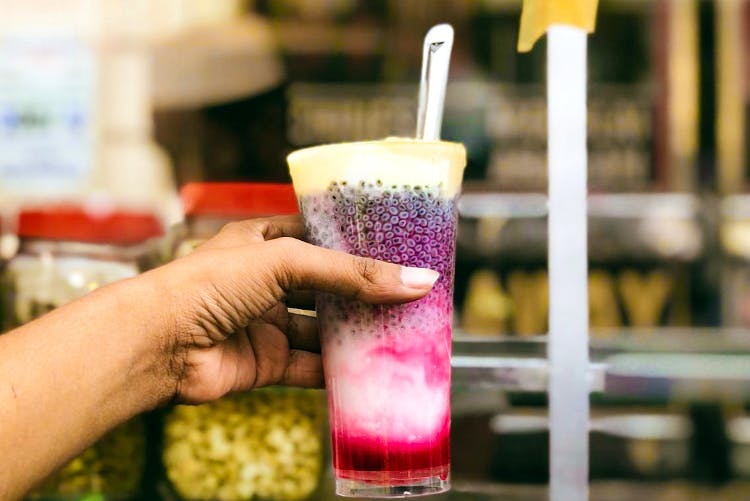 Among the variants of falooda like one with white starched noodles or sago pearls, Masqati serves the one with Basil seeds. These are mixed with fruit blends, cream, and ice cream too. This mixture is finished with dry fruits like almonds, raisins, and cashews added on top. As good as it looks, it tastes better. They serve Falooda in five different flavours – Kesar, Mango, Chocolate, Strawberry and Orange. They also serve a mix of lassi and falooda, as much as they sell the two separately. We had the classic falooda which is a colourful mix. The soft creamy layers with the flavoured milk and jelly-like seeds work like wonders in Summer and can instantly energise you. This seasonal drink is only available in Summers (Until June), so grab a glass today. The special flavours cost INR 60 whereas the classic one that we had costs INR 40. Although this was the stall we went to, you could find any Masqati vehicle or outlet close to you (Banjara Hills, Tolichowki, Dommalguda, Alijah Kotla among others) and relish on this dessert to destress.